The item you are viewing is a Professional Submarine Underwater Inspection System that owns a 7 inch high definition color LED screen. The screen cost low power and it will not give out radiation and this green environmental product will not do harm to people’s health. Besides the storage battery is used as its power supply, which is fast and more convenient. Beside the above this equipment owns a plastic box, which is luxurious, portable, shockproof and waterproof. What’s more it owns high definition low illumination CCD underwater camera, which has night vision function and makes it possible to work underwater in dark condition. 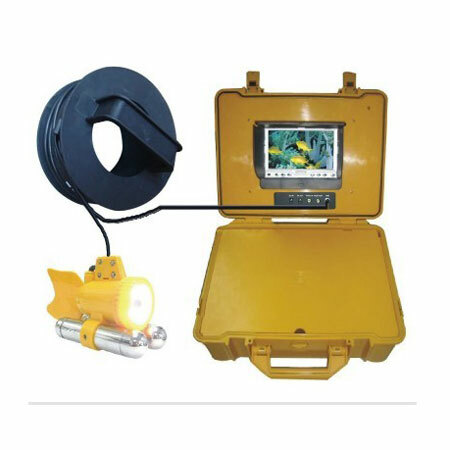 This device is mainly used for underwater monitor, underwater reconnaissance, hydropower station, industry observation, ground water and exploration. And because of the underwater camera it can also be used to examine the underwater holes, underwater operation, fishing ect. More details are at detectorall, if you are interested, just come here and contact, we promised to provide you the high quality products at the best price. It is a littlt expensive, but its qality is really good. Cool product with good design and high technology. The after sales service of your clerk is thoughtful. It is a happy purchasing experience for me. Thanks. Advanced product with multifunctions. I like it very much. Item as described! Thanks so much!